July 21 marked the anniversary of the passing of the Dodd Frank Wall Street Reform and Consumer Protection act. Unfortunately the law has neither reformed Wall Street nor Protected Consumers. The 3,200 page law has spawned several new regulatory bodies, and has granted 11 separate federal agencies the authority and the legal obligation to create over 400 new financial regulations. Over a year later less than 10 percent of the required regulations have been implemented, but Dodd-Frank is already beginning to have negative effects on the economy. The Dodd-Frank act demonstrates Washington’s commitment to circumvent the free market in favor of a corrupt top-down regulatory system where politicians and bureaucrats pick market winners and losers. 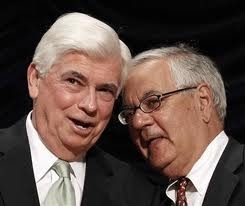 Despite President Obama’s promise of “no more taxpayer-funded bailouts-period” Dodd-Frank includes provisions allowing the FDIC to “resolve” failing financial institutions by borrowing their bad assets with taxpayer’s money. Consumers will have to pay higher debit card fees when the Durbin amendment placing price controls on debit card swipe fees goes into effect this October. The most dangerous aspect of Dodd-Frank is the massive wave of regulation that it is releasing on an already struggling financial sector. Most of the rules required by the law are still unwritten, but according to the government’s own estimates, 2.2 million work hours a year, equivalent to 1,100 full time employees, will have to be devoted to complying with existing regulations. As regulations continue to pile up, small community banks, which lack the resources of huge national banks, will struggle to stay ahead of the ever increasing regulatory burden. No one knows what the regulatory landscape will look like when all 400 required regulations are written. In the face of regulatory uncertainty businesses and individuals are less likely to take risks and make new investments, slowing the already weak financial sector.